The brain is the hardest working organ in the human body, but it’s often the most neglected. If left neglected, you may start to experience some of the following symptoms: Difficulty concentrating, fatigue, poor job performance, burnout, tension headaches or burnout. 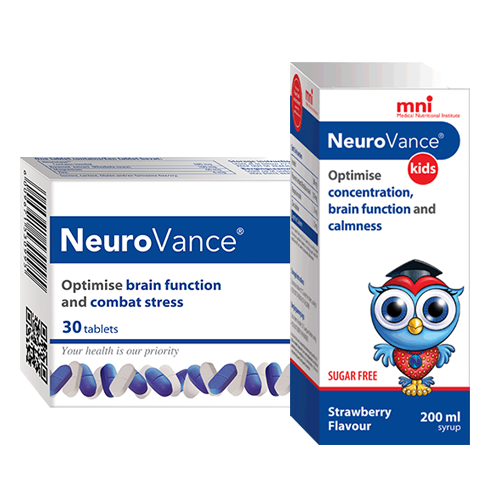 NeuroVance optimises brain function and combats stress. NeuroVance is the only 2-in-1 product able to combat stress and mental exhaustion by supporting healthy brain function rather than by acting as a sedative or stimulant. Its unique blend of plant-based, natural, ingredients works fast and is safe for daily use. What can NeuroVance assist with? NeuroVance contains a unique blend of plant-derived (phytochemical) ingredients that have the potential to support healthy brain function via multiple pathways. Its multi-modal pharmaceutical action enhances separate but interconnected components of brain function, thereby giving your brain a physiological advantage during demanding and stressful periods. The ingredients contained in NeuroVance are roseroot extract, inositol, magnesium and zinc. Who may benefit from taking NeuroVance? Anyone suffering from mental exhaustion, stress or emotional hardship can benefit from NeuroVance. It is ideal during times of extreme work pressure, exams, conflict, bereavement or loss. NeuroVance can also be used as a daily supplement to help you reach peak mental performance. The individual ingredients contained within NeuroVance are generally considered to have a low side effect profile. Mild gastro-intestinal irritation may occur. NeuroVance is non-stimulatory and non-sedative. Can NeuroVance be used in combination with prescription drugs such as anti-depressants, tranquilisers, mood stabilisers and sleeping tablets? Yes, NeuroVance may be used in combination with all the above products, except antidepressant medication that belongs to the class of monoamine oxidase inhibitors [MAOIs] such as tranylcypromine and moclobemide. Consult your doctor if you are unsure about combining NeuroVance with your medication. Where can NeuroVance be obtained? NeuroVance contains a unique blend of phytochemical (plant-derived) compounds that aid with the regulation of mood and concentration under stressful conditions. These are roseroot extract and inositol. Several studies have examined the influence of roseroot extract in relation to symptoms of mental and physical fatigue under stressful conditions. A randomised, double blind, placebo-controlled trial evaluated the effects in subjects suffering from stress-related fatigue by measuring salivary cortisol levels in addition to performing various psychometric stress and cognitive assessments. Cortisol is a known stress hormone and is involved in the regulatory mechanism of the stress response. Subjecting animals and humans to chronic stress produces characteristic changes in the hypothalamic-pituitary-adrenal axis (HPA), including an increase in the level of cortisol and a reduction in the sensitivity of the HPA to feedback inhibition. The hyper-secretion of cortisol may under certain conditions be considered a potential marker to indicate increased stress levels. In this study, the post treatment cortisol response to awakening was significantly reduced in subjects who had received roseroot extract for a period of 28 days, as compared to the placebo-control group (n=60). Several psychometric tests conducted on the same subjects demonstrated a substantial reduction in fatigue-related symptoms and an improvement of various cognitive indicators associated with psychological stress (Olsson et al. 2008). Three double-blind, placebo-controlled studies have also evaluated the effects of roseroot extract in relation to mental performance on subjects that were exposed to increased levels of stress (N total =250). Endpoints included mental work capacity, as measured by various cognitive assessment models. In all trials, mental performance against a background of fatigue caused by stress was significantly improved when compared to a placebo control group (Spasov et al. 2000, Darbinyan v2002, Shevtsov et al. 2003). Two double-blind, placebo-controlled studies evaluated the effects of roseroot extract on subjects in relation to measurable mood disturbances as determined by DSM – IV criteria, namely generalised anxiety disorder (GAD) and mild to moderate depression (N total = 99). In both studies, statistically significant differences were reported in various depression and anxiety scale scores in subjects taking roseroot extract as compared to the placebo control group (Bystritsky et al. 2008, Darbinyan et al. 2000). • Obtain more insight and gain a fresh perspective of your condition. Complete our free assessment to help identify possible solutions to help improve your quality of life. • Complete our free stress assessment for adults to help identify possible solutions to help improve your quality of life.